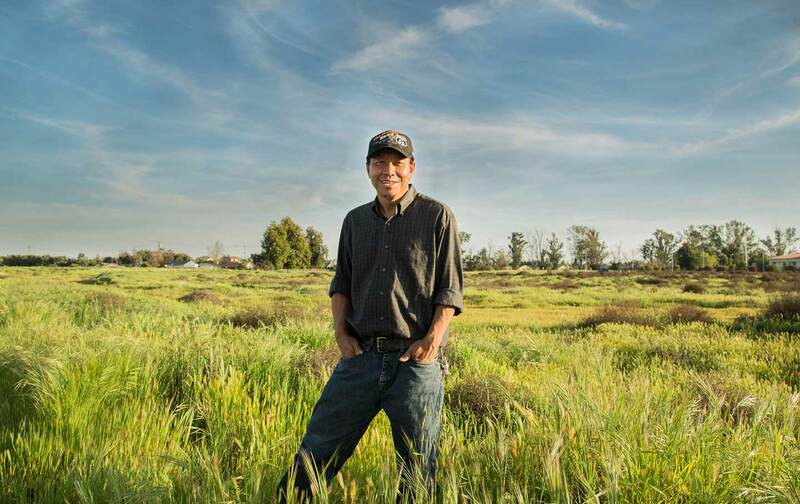 An interview with the president of the National Hmong American Farmers, an association based in Fresno, in California's Central Valley. What, for you, does California represent? California is the melting pot of all ethnicities, all diversity, all cultures. And it starts at the roots of those groups of people through agriculture. We moved out to California from Madison, Wisconsin, years ago, to have the opportunity to farm, to have an independent lifestyle, to chase the American Dream. We came from Laos to the United States after the Vietnam War. I was 6 years old. We moved to Fresno when I was 12. My parents had limited English, limited job skills, worked at minimum-wage jobs. The family came to California during the Hmong New Year and loved it, went back and packed up and came here. It was more community oriented. And farming was a big piece of why everyone moved here in the early ’80s. When we first moved here, a lot of the crops the Asian growers are growing now weren’t being grown. Bitter melon, Thai chili pepper, Thai eggplant. These were names that the packing houses in town never knew till the Hmong moved here. Farming takes you back to the basics, the basics of survival. It gives people an opportunity to add to life. When you put a seed in the ground and you see it sprout up, bear fruit, you see it utilized. I f anybody has been on a tractor in the middle of a cold day, and feel the breeze, they know they’re doing something that adds purpose. There’s a history, a story to each one of those fruits and vegetables. Seed passing, that’s cultural. You have rice seeds, fruit and vegetable seeds — only when you’re close enough will others share that history with you. I just love the people, the people are genuine, they’re sincere, their hearts are in the right place. Their smiles. On the farm, you spend a lot of time by yourself, doing things on your own. You drive up, meet them, the smile on their face says everything. It takes you back to the old times, when a man’s word was a man’s word. It’s time travel. It’s not a piece of paper, it’s a man’s spoken word. Where do you see California’s place in the modern-day American story? California is, and will continue to be, the leader in many, many things that we do. You don’t realize how much effect we have on this country until you start to travel. So many things come out of California. The California Dream is the diversity. And we embrace it, we accept it, we live with it. I don’t ever see it as a negative. The diversity is everywhere. You go to the farmers markets and you see the ethnic food, the ethnic crops, the ethnic people. We don’t think much of it, but you don’t see it elsewhere. When you tell friends or relatives who live somewhere else about California, how do you explain this state? People explain it to me. They tell me how fast we talk, how fast we walk, how fast we do things. They talk about how competitive Californians are, how everyone’s always pushing to move forward. In other states, we don’t tell people to hurry; it’s a little bit slower. Everything in California is magnified, from our success to our failures, from how we do things to how we speak to how we get along with others. The bar’s been set. We hold ourselves to higher standards. That’s something to be proud of. The diversity forces us — allows us — to be anybody we want to be, and at the same time to accept who we are. If you move from a country that’s war-torn to a safer place, [like] Wisconsin, then you look for the next opportunity, a warmer place. That’s California. Warmer means the climate, but it also means the soul, a place you can belong to, that’s home, where your people gather, where your culture is celebrated. Difference is what makes us better. Difference in skin color, background, philosophy, lifestyle. That’s what is needed to create a home as a whole. If you don’t have that diversity in the way you see things and embrace the change, the differences, you don’t grow as a person. What you dream, you can become; what you want, you can have. It’s a theme, a philosophy of life, a way of living. I am always optimistic. We’re just human beings, with a different shade, a different appearance. But inside we all strive for the same things: peace, love, respect, family.